29 Mar Where have all the good wools gone? 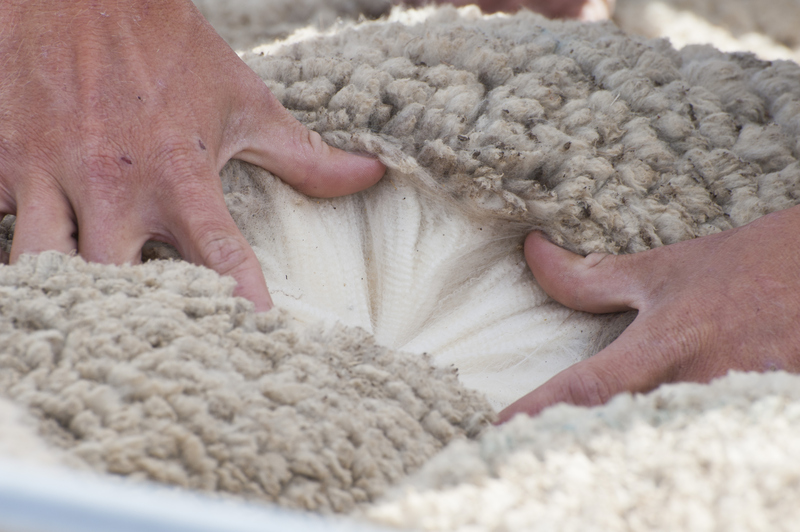 The prevalence of poor quality wool has dragged the market down for a fourth week in a row. Lower style types were discounted by around 20 to 40 cents from last week’s base and this was enough to pull most individual Merino categories down. AWEX reported that many of the lower styles also possessed poor additional measurements. These styles made up the highest proportional level of the Merino fleece offering since 2010. 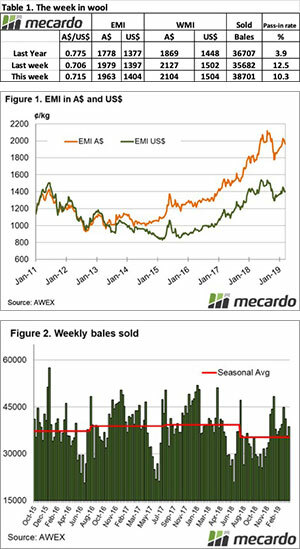 This week’s analysis piece looked into the drought implications on this seasons wool specifications and is worth a read (view here). The Eastern Market Indicator (EMI) fell 16 cents to 1,963 cents. Improvements in the Au$, back above the US $0.71 mark, helped lift the EMI in US$ terms slightly. It rose 5 cents to end the week at 1,403 US cents (Table 1). In Fremantle, the Western Market Indicator (WMI) declined by 23 cents to finish at 2,104 cents. 43,129 bales were offered for sale this week, 2,344 more than last week with the trade clearing 38,701. This is 3,019 more bales than last week, however, sellers are still not satisfied with the market levels, passing in 10.3% of bales. In the auction weeks since the winter recess, 1,059,086 bales have been cleared to the trade, 191,241 fewer than the same period last year. The average shortfall cleared to the trade compared to the same time last year now sits at 6,374 bales per week fewer. The dollar value for the week was $81.54 million for a combined value of $2.487 billion so far this season. A simple calculation of $ value divided by bales sold gives us $2,189 per bale across all types. Crossbreds were the only category to see improvements this week. Gains of 10 to 20 cents were recorded in Melbourne. The Cardings sector felt the biggest cut of the week. Across the three indicators, declines of 30 to 70 cents were recorded from last week’s sales. The roster for next week predicts an offering of 38,950 bales with further falls to 37,787 and 35,735 in the weeks proceeding. The lower offerings over the next few weeks may bring about added support for the better-quality wools. Whether there will be enough presented compared to the lower styles to lift the overall market remains to be seen.